The best mini drone with camera will be small enough to hold in the palm of your hand. It should also be features rich, which means that can help novices and even kids learn how to pilot a quad copter. Since they are small enough, they are safe for indoor flying. The frames should be designed to be stable enough so that they can withstand a certain amount of turbulence. We will look into these and other details in this comparative review. 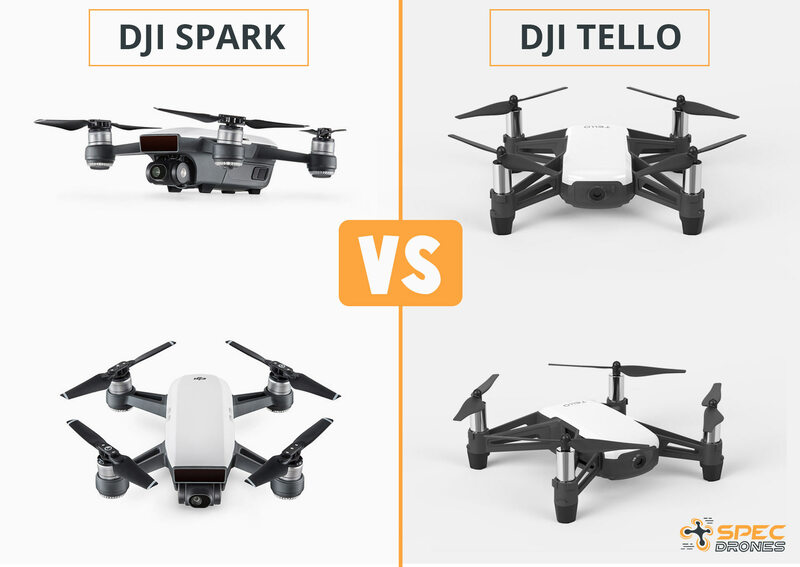 We’ll be comparing two of the best and smallest drones in the DJI Enterprises product line, namely the Tello and the Spark. We’ll go over what’s great about each of them (and what drawbacks you should know about) and which one should you get. The DJI Spark comes highly recommended when people talk about a mini drone with camera. Note that it may be sold with or without a remote control. It depends on the package you’re buying. Some packs have the remote control sold separately, which is a bummer since you usually expect a drone to have a remote, right? Hint: get the fly more combo when you order your Spark from DJI. But don’t let that ruin the product experience for you. The DJI Spark is actually a highly rated quad copter. So, why don’t they sell the controller automatically with this drone? The answer is simple. This model is equipped with video gesture controls as well as DJI’s very own TapFly Control. But how good is the remote-less flying of the Spark? To be honest, it’s okay but it isn’t as smooth as one should expect it. Maybe it depends on the quality of your signal since you’re just using your phone. If you opt for the gesture controls, they’re fun and you can already take selfies with it but you can’t teach your kids how to actually fly a drone that way. Oh by the way, you need to be at 10 feet or less away from the drone for the gesture controls to work well. Select PalmControl if you want to use hand gestures. Now, here’s the thing—flying it with a remote makes a hell of a difference. The remote has a huge impact on the level of control and it greatly improves the flying experience. The gimbal movements are really smooth. The app of course has lots of good features. That’s where you activate the gesture controls, you can set the Spark to track and follow an object (you can make it follow you around), etc. If you’re flying it indoors, don’t worry about it hitting anything along the way. The Spark has sensors that allow it to weave through obstacles. Make sure to set it to normal flying mode when indoors. That way, it doesn’t fly so fast. If you’re outdoors and you want to really give it whirl, then set it to sport mode. Believe it or not, you can fly this thing faster than 30 miles per hour. It’s as big as a soda can; what more can you ask for. It’s that tiny—and it weighs only 300 grams (around 10 ounces, I guess). The propellers fold in and you can stuff it in a bag when you’re done with it. But please put it back in its foam box to keep it safe. The build quality is top notch. Out of the box, the drone feels like it’s solid as a brick. No flimsy parts whatsoever. Apart from the fact that you have to opt in to buy the remote when you order your package, there are a few downsides to the Spark that you should know about. The price of the drone is going to be an issue for some customers. It’s in the $300 and up price range—for the drone only. You have to pay extra for the remote and other stuff. Another downside is the flight time. On average, you can fly this quad copter a little over 12 minutes—well, 16 minutes if you’re just flying in the house and taking selfies. Why Get the Fly More Combo? The Fly More Combo has a lot of perks. First off you get a controller, which improves your experience. The package also includes replacement propellers and extra batteries, which means more flying time. We feel that this is a must for any mini drone with camera. The Tello is another drone that you can fly from the palm of your hand. It’s a nice looking mini drone with camera. This drone is one of those “toys” that parents and kids can enjoy and spend quality time together. The Tello also has solid build quality. It has a nice sleek look and it fits in the palm of your hands. The package we’re reviewing came with a VR headset, remote, extra batteries, and extra propellers (get the fly more combo!). The coolest thing about it is that it is more affordable than the Spark. Seriously, you’re getting all that for less. The Tello shoots incredible images, just like the Spark. It comes with image stabilization so your videos and stills are nice and crisp. It shoots at 720p and you can fly it at FPV. So, what are our recommendations? If you are looking for a solid and feature rich flying experience that can really teach you how to fly like a pro then get the DJI Spark. However, if you are a bit tight on the budget then get the Tello. These are recommendations for the best mini drone with camera.